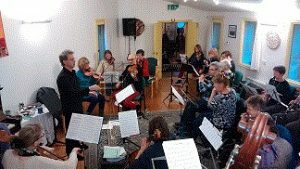 The All 4 Music Scratch Orchestra is an exciting and enjoyable opportunity to meet with other people and play those instruments you have gathering dust in cupboards at home. You may be one of the people who has joined us so far on the Scratch Orchestra journey or perhaps you are a learner wishing to play in an orchestral setting to hone your skills or a lapsed musician who thinks it’s time to take it up again. Whatever your reason or level there will be something for you to enjoy. Come and spend a creative and educational day as Roger Huckle leads us through an approachable and inspiring selection of material. Roger Huckle is founder of the Bristol Ensemble. Born in Bristol, Roger studied at the Birmingham Conservatoire and with Frederick Grinke. As well as being leader, Artistic Director and first violinist of the Ensemble, Roger is also a visiting member of Norway’s Bergen Philharmonic, and performs with leading UK orchestras – including co-leading the London Concertante and Swansea City Opera Orchestra.